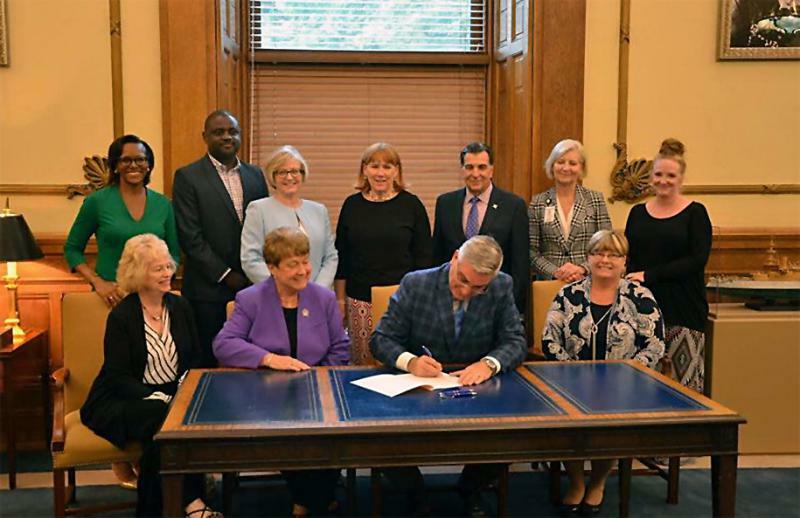 Governor Eric Holcomb signs legislation to create the Maternal Mortality Review Committee. Sheridan: Give us the stats, the information that really stands out. Indiana kind of behind other states in these rates of maternal mortality. Bavis: Maternal mortality is when a woman dies in pregancy, or during child birth or the first couple weeks after child birth. The United States has the worst rate of maternal mortality of all developed nations and Indiana's rate is twice as bad. Nearly 21 women die for every 100,000 women in the U.S. it's closer to 41 in Indiana. Sheridan: Many doctors understand that bleeding or stroke are leading causes, but other states that have completed these reviews have found that cardiovascular complications are often more prevelant. Also some of Indiana's traditionally poor health measures, diabetes, unitended pregnancies, these are all factors that play into these high rates of maternal mortality. You had a fantastic source in your story. Can you tell us a little bit about what was her problem? Bavis: Sure, Courtney is a 23 year-old Indiana woman and she had a pretty smooth pregnancy. Delivery was a little bit difficult it was 10 hours of labor, but then if was a full week after she'd given birth, she just had this really bad headache. Thankfully, her family thought she should go to the doctor and so she did. They found out she had postpartum eclampsia, most people have heard of preclampsia which is this issue of seizures before delivery, but with this she had it a week later. She had very little symptoms but she could have had massive organ failure, strokes or seizures if she been to the doctor any later. She had to be hospitalized for a full week and that's not that uncommon in Indiana. Sheridan: And she a young, healthy, 23 year-old mother who lucky saw these signs, knew enough to get to a doctor, had access to a doctor. Bavis: That's pretty common in Indiana as a whole, only 69 percent of Indiana mothers get prenatal care and that could be because in a third of Indiana counties there is no place for a woman to get prenatal care or to deliver their baby, so women are having to travel outside their county to get care from a doctor that could tell them, 'here are these pre-existing conditions that could lead to maternal mortality'. Sheridan: Poor public health funding, on a federal level and a state level, you did take a look at that as well in your story. Bavis: So the Trust for America's Health which is a non-profit, non-partisan heath organization, they found that Indiana gets the least amount of federal funding from the CDC about 15 dollars per capita. What the state invests in it's own public health is even less than that about 12 dollars. Public health is paying for everything from tracking how disease spreads to creating community awareness programs that educate folks and create resources especially for vulnerable populations like low-income women or women who haven't had access to regular doctor care much less prenatal care. Sheridan: so as we look forward to what the state of Indiana is going to be doing, we know the state has addressed infant mortality, made it a priority and our rates have gone down a little bit. As far as maternal mortality with this legislation, what's your understanding? Bavis: So the 17 person committee will be formed sometime throughout this summer, a lot of different stakeholders, people from the State Department of Health, people in health care and when this group comes together their job is going to be to review every maternal death, death of a new mom or during child birth. They're going to analyze that and then every year report those findings and that will come up with some of the instances of why this is happening, because that is the big question. Lauren Bavis is a multimedia reporter and editor for Side Effects Public Media. You can read her full story at sideeffectspublicmedia.org .